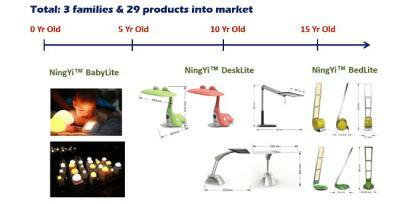 First-O-Lite (FOL) was established in 2010 in Nanjing, China with an aim to become an OLED lighting developer and producer. Based on its hybrid tandem architecture, FOL has a 2-Gen OLED lighting production fab that is currently producing 70 lm/W OLED lighting panels. This article details the company's OLED lighting panels, its strategy to create an initial health-lighting niche market in china, its current product families and its technology and business roadmaps going forward. 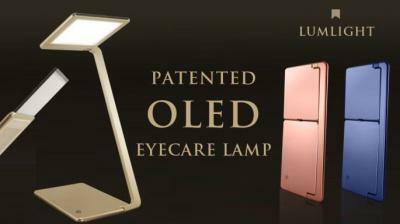 During the International Display Workshops that was help a few weeks ago in Fukuoka Japan, LG Display discussed its new WOLED tandem stack that it plans to introduce soon to its OLED TVs and lighting panels. LG Display says that its new stack is a "3-stack-OLED" while its existing stack is a "2-stack-OLED". 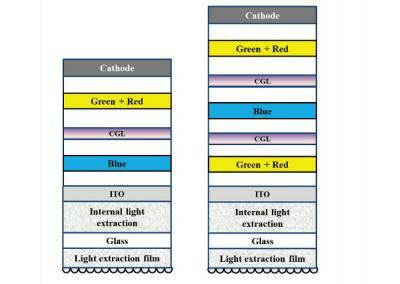 As you can see in the image above, LG apparently counts each emissive layer as a different stack in this case. OLEDWorks announced that the Brite 2 OLED panels are now available. The company's latest OLEDs, announced in March 2016, offer a brightness of 300 lumens, a high CRI (>90) and an efficiency of 60 lm/W. The Brite 2 OLED comes in either 3000K or 4000K, and is now available as part of a promotion kit which includes four panels for $199. 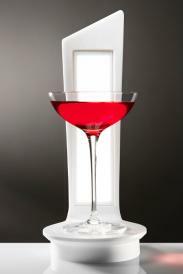 Visa Lighting introduced the company's first two OLED products, the Limit and Petal. These are two pendants lighting fixtures, each using three OLED panels that deliver a combined output of 850 lumens. 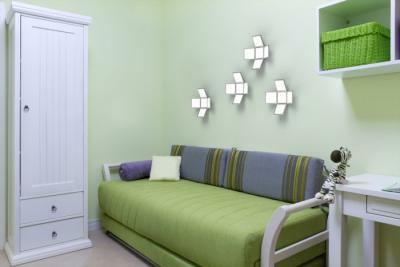 The panels offer a color temperature of 2900K and a CRI of 80. I'm not sure but these seems to be OLEDWorks/Philips Brite FL300 OLEDs. Visa Lighting did not reveal the pricing of these panels, nor the availability - but it's great to see another lighting maker adopt OLEDs. A few days ago, the US Energy Department (DoE) announced its tenth round of efficient SSL lighting awards, awarding more than $8.2 million to nine projects. Today the DoE released more details about the projects it awarded in this round. 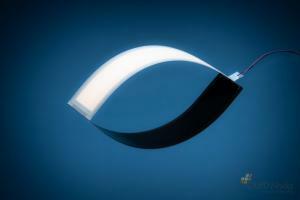 There are four OLED projects, awarded a total of $3.8 million. Acuity Brands received $455,131 to develop an OLED Luminaire with integrated DC current drivers in each panel and advanced controls. The goal is to demonstrate a luminaire with an efficacy of 65 lm/W and a luminous output of 4,000 lumens. A couple of weeks ago LG Chem announced that they have started to mass produce the world's largest OLED lighting panel at 320 x320 mm. 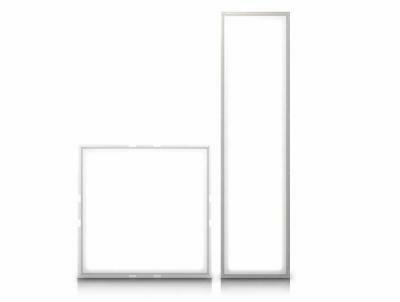 The panels are 0.88 mm thick and feature 60 lm/W, CRI of over 90 and an output level at 800 lm - 1,200 lm. LG today revealed that the panels cost $680 per panel (lower prices for bulk orders). 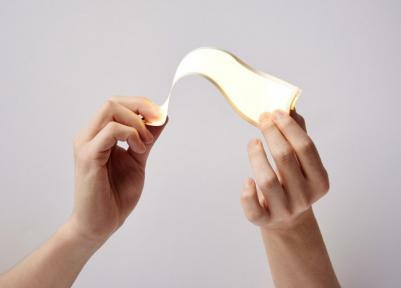 LG Chem also announced that they completed the development of their "truly flexible" plastic-based OLED panels. They now offer engineering samples for $250 and mass production is expected by July 2015. Prices will be lower when mass production starts.